These Candy Shamrocks are so easy to make and look great on top of cupcakes, or make a bunch and put them in a bag for a great party favor! This craft involves the use of the oven, make sure children are supervised! 1. One a foil-lined baking sheet, place 3 lifesavers in a triangle shape. 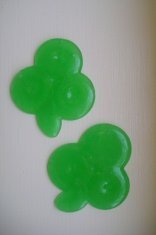 Break on of the lifesavers and place a piece under the triangle to make the shamrocks' stem. Make sure all of the candy is touching each other or it will not melt together properly. 2. Heat your oven to 250F and bake for 5-8 minutes or until your candy has melted together. Keep in mind that the candy will melt a little bit more after you have taken it out of the oven. Enjoy your Candy Shamrocks!